There are only about seven weeks to go until the 2019 NFL draft, and right on time, you had some anonymous criticism of an African-American quarterback that has caused a ruckus. 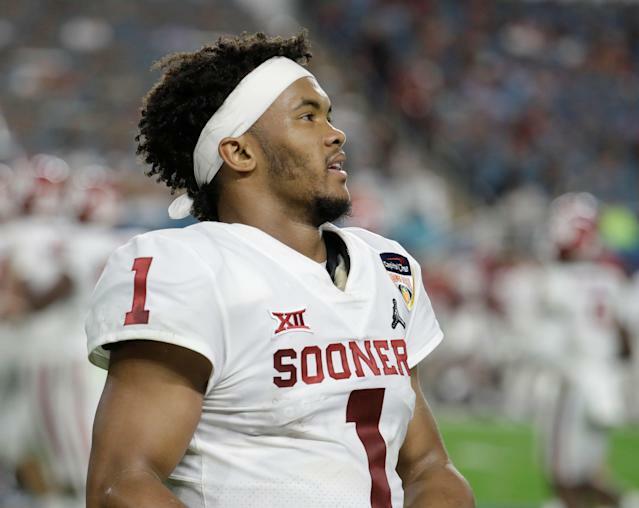 This year’s round of unnamed, anonymous jeers were revealed earlier this week by NFL Network analyst and former Houston Texans general manager Charlie Casserly, who said the reviews he heard from teams about Kyler Murray’s interviews at last week’s NFL scouting combine were the worst he’d ever heard for a top quarterback prospect. Given the NFL’s um, not-so-progressive history when it comes to black quarterbacks — future Hall of Famer Warren Moon, who possessed prototype size and a howitzer for an arm, went undrafted in 1978 — it’s no wonder why some might emotionally equate Casserly’s comments with the past stereotypes about black quarterbacks being too dumb or too inarticulate to lead a professional football team. Murray should stay out of the weeds on this, ignore what Casserly heard and take them with a grain of salt. Because teams were always going to nitpick the hell out of him. Even though he emerged as a combine winner by checking in at 5-foot-10 and 207 pounds, that is still undeniably small for a quarterback, especially one being bandied about as a potential No. 1 overall pick. Understand, NFL teams hate making physical exceptions on players in the first round, with many seeing a guy who’s too small or too slow as a quick way to get fired if it doesn’t work out. The NFL hasn’t seen a 5-10 quarterback go in the first round since 1953, so if a team is going to buck that trend and take Murray, it better cross every “T” and dot every “I” in the evaluations. So, on a positive note, maybe the negative comments are coming from some team that’s in love with him, in hopes of scaring others off. Or, to be more cynical, maybe teams are just annoyed Murray has thus far refused to bend over backward to impress them. He didn’t put the baseball thing — the Oakland A’s drafted him in the first round last year and he was widely expected to play that sport professionally for months until his breakout 2018 campaign — to bed until a week before the combine, where he didn’t work out. That probably annoyed some teams who wanted to compare him to his first-round positional competition, like Dwayne Haskins and Drew Lock, and perhaps contributed to the scathing critique. Add all that to the fact Murray is a serious man, someone who won’t routinely smile at the cameras and win people over with his charm and brashness, and I get how he didn’t have all favorable reviews from those who interviewed him. I interviewed Murray last week, and he was clearly tired of the repetitive questions about his height and hand size, and uninterested in diffusing concerns through humor or an upbeat attitude (as many black quarterbacks, like Jameis Winston and Lamar Jackson, had done before). But let’s be fair here. If Murray knew he’s going No. 1 to the Arizona Cardinals, it would make sense that he didn’t go all out to impress in those interviews with other teams. What’s more, on a personal level, I came away liking Murray, feeling he was just a serious dude who was more dignified than introverted. For the sake of argument, let’s assume Murray isn’t going to be a big vocal guy in the locker room. While conventional football wisdom states a quarterback must have some ability to inspire with words and make 50-plus grown men follow him, given the state of today’s pass-happy NFL, you don’t have to be vocal like Philip Rivers or Brett Favre to be the face of the franchise ... all you have to do is win. More important than charisma in the NFL: respect. And you know how you get that from teammates? By playing well on Sundays. Never forget, the NFL is a performance league, and when someone performs well, nothing else matters. After all, no one was calling Eli Manning a great vocal leader, and he wound up winning two Super Bowls. So, really, any team in the first round looking to take Murray shouldn’t care about those reports. Especially the Cardinals, because there isn’t much doubting that Murray could be a dynamic fit in the spread, up-tempo offense that new coach Kliff Kingsbury plans to bring to the NFL. To officially convince the Cardinals (and others) of that, Murray must first nail his pro day at Oklahoma on March 13, when he’ll run the 40 and throw in front of all 32 team. If Murray performs well enough there, then someone, if not the Cardinals, will likely take a shot on him in the first round – no matter what Casserly said. And if Murray goes to that team and starts winning ... well, you already know how this will end. Murray’s supposedly weak intangibles — no one outside of his coaches and teammates at Oklahoma really know if that’s the case — will turn into positives, as teammates and fans will start looking at him like he’s the football equivalent of a Hollywood trope: You know ... the strong, silent type. And combine criticism of his “board work” will be a footnote.